The "Default Language" option sets the initial display language for MIDAS. If the "Show Language Selector on login page" option is also selected, users will be allowed to change their display language whenever they login, otherwise the default language will be used throughout. The "Default View" option sets which "group" of venues (venue group) will be displayed initially to users upon login. Where a given user does not have access to this venue group, the first group they do have access to will be initially displayed instead. Specifies the visual Theme MIDAS should use by default. This option will present all MIDAS users a drop-down list of installed themes on the Login page, allowing them to select a different visual theme for their session. Please note, that this setting has no affect if only one theme is installed. 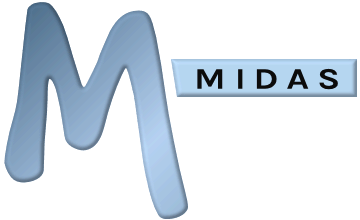 You may co-brand your MIDAS system to include your organization's logo throughout the software. This logo may then also be included in various editable templates (email, print, invoice, etc) through the inclusion of the %LOGO% variable. Click the "Select File..." button to select a .png image from your computer to upload and install as your logo. Controls the order in which dates are displayed, i.e. day before month, month before day, 2 or 4 digit years, etc. Allows changing of the single character used to separate the day, month, and year segments of dates. Switches between a 24 hour or 12 hour clock, with the two "12h Format" boxes providing control over "AM" and "PM" symbols under a 12 hour clock. Allows changing of the single character used to separate hours and minutes. If the "Show Date Before Time" option is selected, then where both date and time information are displayed together, the information will be displayed with the date first, followed by the time. If unselected, times will be shown before dates. Allows control over the visual "link" between dates and times. For example, a value of " @ ", would display dates & times in a similar manner as follows: 17/08/2007 @ 14:06. Allows control over the visual "link" between two times. For example, a value of " - ", would display a time range in a similar manner as follows: 14:00 - 15:00. Rather than displaying every single minute (0-60) in time drop-downs when adding or modifying a booking, this setting allows you to "round" minutes to, for example, the nearest 5 minute interval, if you don't need to book to the minute. Sets which day of the week MIDAS should consider as being the first day of the week. Nearly 300 pre-defined timezones are available in a drop-down list, allowing you to specify the timezone in which your MIDAS should run. The "Custom" option at the bottom of the drop down list allows defining your own custom timezone. Specify up to two booking fields to show on blocks within the booking grid. You can choose to show just the field's value or its name and its value on booking blocks. Specify up to two booking fields to show when "hovering" over blocks within the booking grid. You can choose to show just the field's value or its name and its value on tooltips. Specifies the height (in pixels) of each "row" in the booking grid. Increase this value to show bigger blocks in the grid. Specifies the width (in pixels) of the first column in the booking grid. This column usually contains the venue name. Increase this value if you have long venue names that don't fully fit into the first column. The booking grid can display 1 day - 8 weeks' worth of bookings on a single screen. Use this setting to control how many days are shown by default (up to 14). When viewing the booking grid, MIDAS can silently perform regular background checks on the bookings currently shown on your screen and update your display accordingly if any have changed since your display was first generated. Lower values will perform these checks more often, but will increase the number of requests sent to and data received from your server. In most cases, it should not be necessary to change this setting. Specify a default booking field to show on dates within the monthly overview. If selected, allows users to select any booking field to view on the monthly overview. If not selected, all users will only see the monthly overview using the above "Show on Month Cells" setting.